Sadly we don’t have enough archers in british reenactment, as a large group launching arrows in volleys are an impressive sight.Reenactment archers give displays of archery skill using longbows and sharp arrows in target shooting. In battle reenactment archers launch blunt arrows with special rubber heads, these are normally fired at a high angle to land amongst the opposing troops. 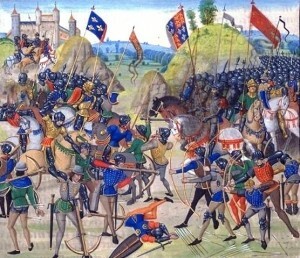 In medieval battles archers would probably have started the battle with thier bows, then later entered hand to hand combat with swords, daggers and mauls. Some reenactment archers do too, but it most do not, so archery is popular with reenactors who want to take part in the battle but don’t fancy too much violence!We have several keen archers in the group.